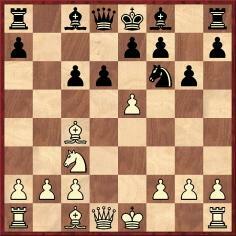 Stephen Wright (Vancouver, Canada) asks why the moves 1 e4 c5 2 Nf3 d6 3 d4 cxd4 4 Nxd4 Nf6 5 Nc3 Nc6 6 Bc4 g6 7 Nxc6 bxc6 8 e5 (8...dxe5 9 Bxf7+) are regularly referred to as the ‘Magnus Smith Trap’. He has been unable to find any game or analysis by Smith with that line. 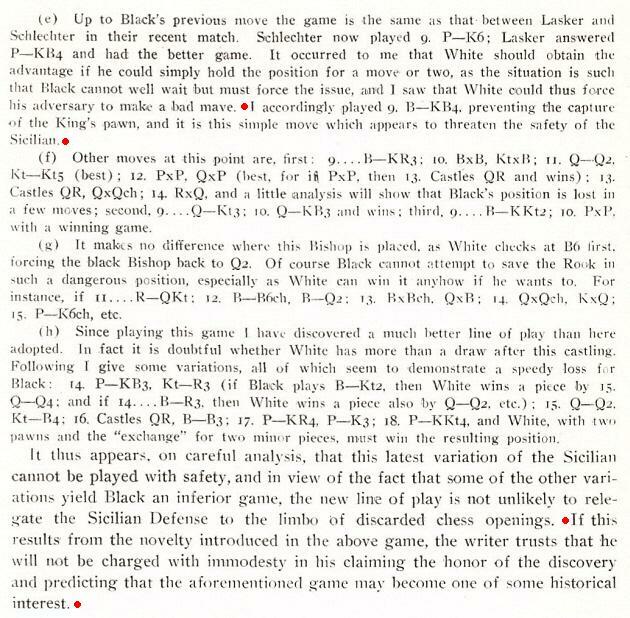 We believe that ‘Magnus Smith Trap’ is a misnomer, although in the Sicilian Defence there is a ‘Magnus Smith Variation’ (a very rare instance of a player’s forename and surname being used jointly in openings terminology). 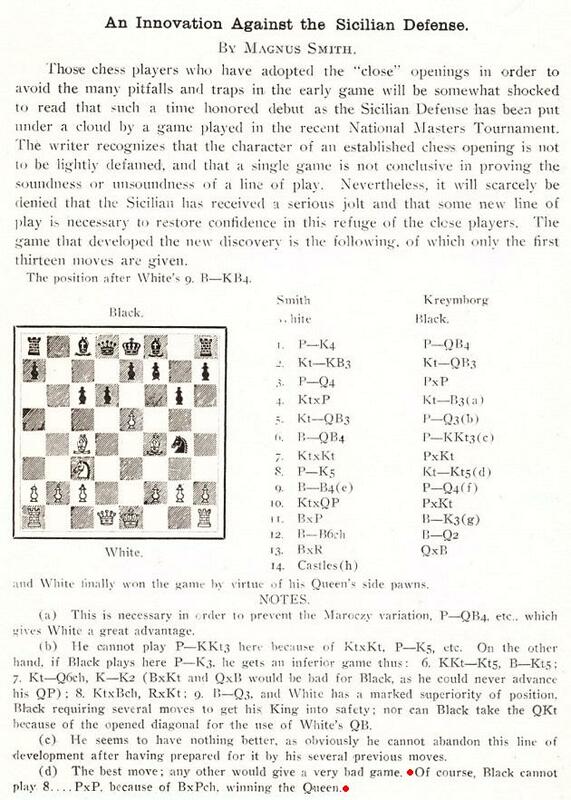 Although the line 8...dxe5 9 Bxf7+ was mentioned, in note (d), Magnus Smith’s innovation was 9 Bf4, proposed as an improvement over 9 e6, which Schlechter had played in his seventh match-game against Lasker the previous year. 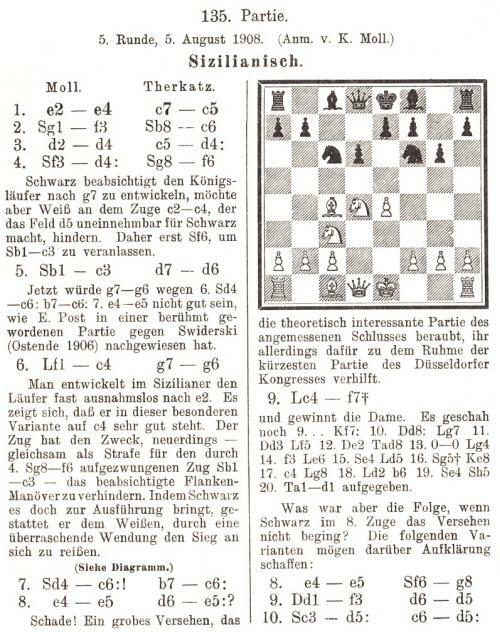 The term ‘Magnus-Smith variation’ for lines beginning with 9 Bf4 was used on, for instance, page 168 of the April 1927 BCM, as well as by W. Winter on page 76 of Kings of Chess (London, 1954) in his notes to the above-mentioned Schlechter v Lasker game. 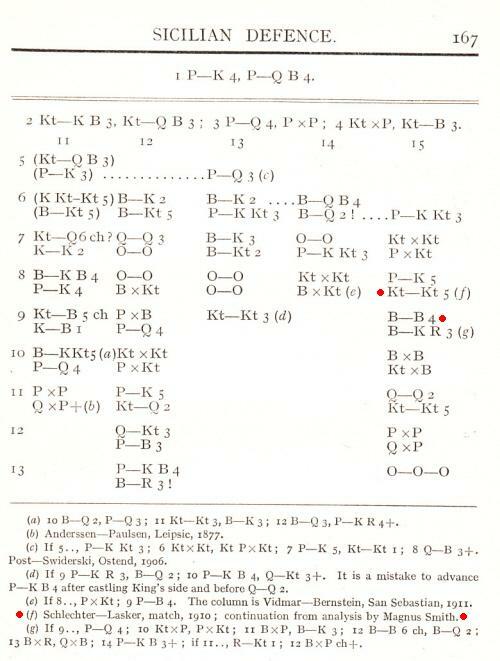 The possibility of 8 e5 dxe5 9 Bxf7+ had been referred to in print when Magnus Smith was 12 years old, on page 175 of La Stratégie, 15 June 1882, in a note to Blackburne v Paulsen, Vienna, 1882 (where the moves 8 e5 Ng4 were played). W.M.P. 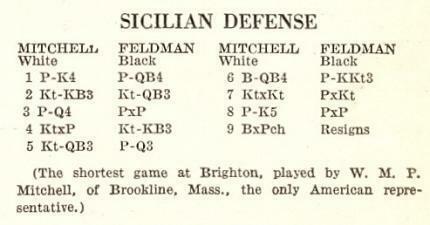 Mitchell and S. Feldman were participants in the First Class B tournament of the British Chess Federation Congress in Brighton (BCM, September 1938, page 418). As demonstrated in the present item, it would not be justified to describe their game as featuring the ‘Magnus Smith Trap’, but when was that term first used in print? All bids will be welcome. 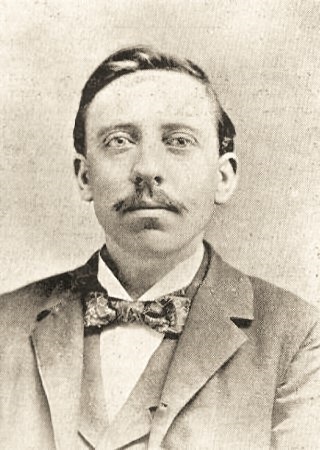 A number of interesting photographs, including one featuring Magnus Smith, can be viewed at the Libraries and Archives Canada website. Latest update: 1 January 2014.